Lots of IT professionals use Windows 10 or Windows 8 and Hyper-V to run various virtual machines. Naturally the really important VMs you would want backed up often and efficiently, but how exactly is a Windows 10 client Hyper-V backup set up? 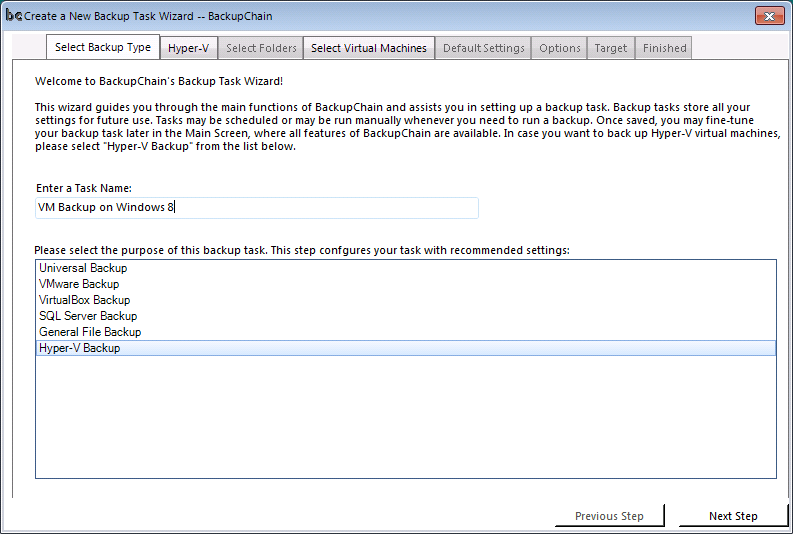 Below are the steps to set up a virtual machine backup task using BackupChain, a server backup software for Windows which also works on Windows 10 / 8 and Windows Server 2016. Note above the awesome feature 'backup all selected VMs simultaneously'. This is not for speed but for multiple-VM consistency. For example, if you had an application VM and several database VMs, you could back them up together so you have a consistent backups across several VMs. Very useful indeed! Next, you will see a screen with options, you can safely use the recommended defaults for now and tweak later if necessary. The Hyper-V tab is the place where you can update the VM selection at a later point. If you use external hard drives as backup target, you can freely rotate them as long as they are using the same drive letter. Windows Disk Management may be used to configure drive letters for your existing disks. Windows 8 virtual machine backups made with BackupChain may be also restored on Windows Server 2008 and later, and vice versa. Windows 10 VM backups may be restored on Windows Server 2016 as well. 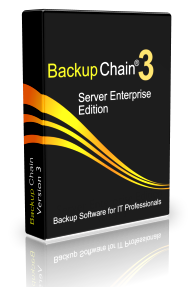 BackupChain also backs up VMware, SQL Server, Microsoft Exchange and many other services. BackupChain won’t waste storage space as it backs up large VM files with deduplication. Every incremental backup is usually within 5-10% of the original size. In addition, VM backups may be sent offsite or to the cloud for additional protection against local disasters. A PDF user guide is available with many screen shots and tutorials. No other backup tool offers backup deduplication over standard FTP and in combination with Hyper-V, it's a huge time and storage saver. You could, for example, configure a home server to receive FTP backups from work, encrypted and using deduplication. Hyper-V backups created on Windows 8 can be easily restored on a Windows Server 2008 or later. Conversely, if you have virtual machines hosted on Windows Server 2012 R2 you can move them to Windows 8.1 by backing them up and restoring them on Windows 8. Windows 10 VMs can be restored on Windows Server 2016. These features are all unique to BackupChain. BackupChain backs up and restores the entire VM and all of its files automatically: VHDs, Checkpoints, Snapshots, and configuration. 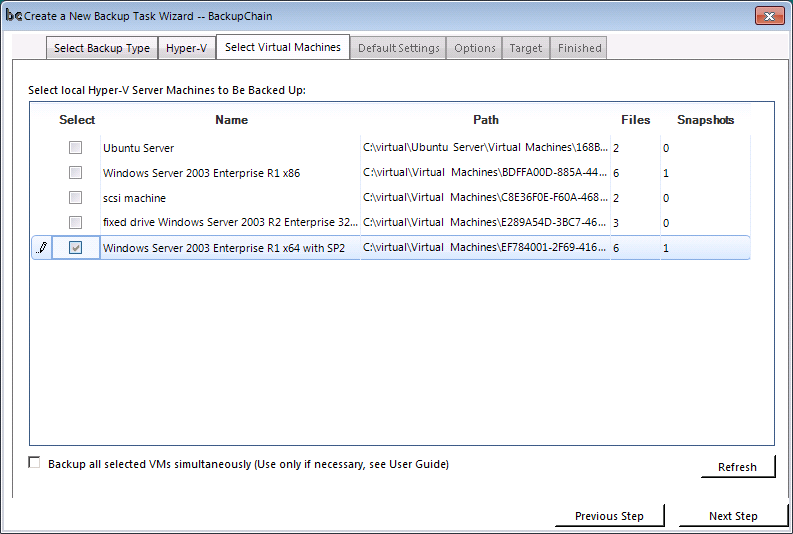 Backup and restore of Hyper-V VMs is automatic and completed with just a couple of clicks. Hyper-V virtual machine backups can be restored on any other Windows version with Hyper-V, whether Windows Server or Windows 8 or Windows 10.